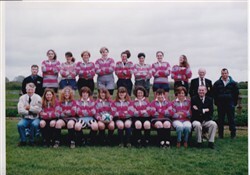 Colour team photograph in kit. Players listed as: K Field, S Jay, T Kennedy, A Crouch, B Harris, S Broadbent, K Field, A Scott, J Field, S Atkins, G Proudfoot, A Collyer (captain), L Kerr, H Williams, P Smith, K Hargreaves. Coaches: P Dowsett, P Sowman, S Sowman, T Hacker, S Hargreaves, L Fairey (President).